Hibs scored twice in the opening five minutes of this SPL clash to claim maximum points but they failed to capitalise on their emphatic start. 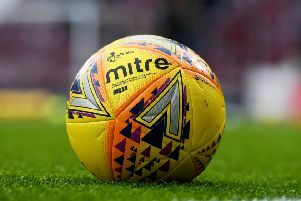 Striker Colin Nish took full advantage of a slack clearance from Saints goalkeeper Chris Smith to fire Hibs into a fourth-minute lead and Moroccan ace Merouane Zemmama doubled their tally with a contender for goal of the season seconds later. However, Mixu Paatelainen’s side were lacklustre thereafter. The home fans, having settled down to what promised to be a goals feast, endured a nervous performance as Saints shrugged off those early setbacks to dominate the game for long periods, particularly in the second half with goalkeeper Andy McNeil producing three stunning saves from Will Haining to preserve Hibs’ lead. Hibs needed a win to stay in the hunt for a Uefa Cup place but failed to make up ground on third-placed Motherwell, who enjoyed a surprise victory at Celtic Park. Nish was gifted the opening goal after a blunder from goalkeeper Smith, who fluffed a kicked clearance straight to the Hibs striker. The centre forward netted his fourth goal after joining in January with a sublime chip over the retreating Smith from 25 yards out. Zemmama extended the lead just 60 seconds later with a thumping shot from 30 yards which flew past the bewildered Smith and into the top corner of the net. Steven Fletcher had the ball in the net for a third time in the 12th minute but was adjudged to have strayed into an offside position as he headed inin Thierry Gathuessi’s cross. Following a St Mirren corner, Zemmama broke with speed and trickery and found Nish in a promising position but Smith raced from his line and managed to stop the striker’s flicked finish when a goal looked certain. St Mirren were under siege for much of the first half but the game fell rather flat after half an hour and the visitors managed to spring one or two attacks. Buddies striker Craig Dargo sent a header wide from seven yards on 37 minutes and McNeil saved from a long distance effort from Andy Dorman. St Mirren made a bright start to the second half but were fortunate not to concede another goal when defender Alan Reid headed against his own crossbar from an inswinging Zemmama corner. David Barron cracked a sweet volley on target but McNeil made a terrific save to push it over the crossbar after 58 minutes. The Hibs keeper then made another two fabulous stops to deny Haining. The defender thought his header had crossed the line but McNeil clawed it away then acrobatically kept out a powerful volley. St Mirren substitute Stewart Kean and Haining tested McNeil in the final minute but the Scotland under-21 internationalist again made impressive saves. Hibs: A McNeil, T Gathuessi, C Hogg (R Chisholm, 61), M Canning, A Zarabi, M Zemmama, I Murray, J Rankin, D Shiels (L Stevenson, 76), S Fletcher, C Nish (C Donaldson, 83). Subs not used: A Benjelloun, F Morais, Y Makaba-Makalamby, B Kerr. St Mirren: C Smith, A Reid (S Kean, 80), W Haining, J Potter, I Maxwell, H Murray (R Brittain, 50), A Dorman, G Brady, D Barron, B Mehmet, C Dargo (J Hamilton, 76). Subs not used:S McGinn, M Docherty, M Corcoran, P Mathers.